Later in the month, during "Trophy Run" you may see two different Bet tables. This is because, for high score purposes, ANY return helps your score. Therefore, I'll make bets that I expect to lose neopoints on but that should yield some return in order to boost your score. For example, a return of 6:10, while losing nps in terms of profit/loss, would add 44,000 to the score of someone with a 10 year old account if they bet the maximum. *Lifetime ROI is calculated as Win Total / Bet Total in my Bet History so includes returns on days I've advised skipping, both positive and negative, as well as returns where I've messed up my personal bets but corrected them for the page. *August 2013 includes a week of skipped days while I was on vacation. **July 2014 includes eight skipped days while I was on vacation. ***September 2014 includes ten blank days because of the transition, either directly via neo being out or indirectly due to FC not processing. ****October 2014 includes nine blank days due to FC not processing as well as one I missed coming on that it did. Trophies are usually awarded at 11:50 NST during Daylight Savings Time but I think that due to it being Standard time right now, they are being awarded at 10:50 NST instead. Your score in Food Club is the amount of winnings you collect at one time. You can hold 8 consecutive rounds worth. So if you start holding on Round 5000, then you'll have to collect after the results for Round 5007 and before 10:50/11:50pm NST in order to get it posted for that day's trophy awarding. Also, if you wait until after midnight NST, your winnings on Round 5000 will disappear completely. That may not be a bad thing. If you only won a minimal amount (or nothing) on Round 5000 and Round 5008 looks promising, you could intentionally give up Round 5000 earnings in order to try to move up. While I often reference Trophy Run, it is not the sole means of acquiring a trophy, it's just generally the easiest time since that's when the scores are reset. You'll see me talking about Holds, that is what you do when trying for a trophy: you Hold your winnings rather than collecting them. Outside of Trophy Run, I generally recommend starting a Hold when you get a good return, say 40:10 or better, and see how the next few days go. If there is a tank or low return, go on and collect and hope for another Hold later. Keep in mind, also, that you don't have to wait for all 8 rounds before collecting. Let's say you've got 7 rounds worth being held, you're on at 10:45pm NST, and see that if you collect you'd get a trophy (or trophy upgrade), why not go ahead and do it? You could worry about upgrading later and it saves you from the chance of others getting a better return on that 8th day and knocking you out of that spot. When going for a trophy on the usual Trophy Run, keep in mind that account age plays a huge factor in determining your success, especially if you are following a bet page. 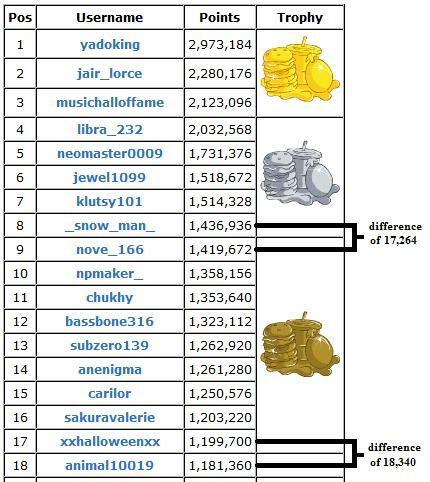 Consider: if 50 people are all using the exact same bets and those bets happen to have the best return, then unless your account is older than 17 of the ones that are holding for the trophy, you won't score enough to make trophy level. This is a perfect example of what I mean when I say even a 6:10 day, to a 10 year old account, can make a difference. Notice that the additional 44k a 6:10 would give was the difference in both Bronze and Silver and Bronze or no trophy at all! In terms of timing, what is considered the "Trophy Run" is when your 8th bet falls after scores have been reset on the 1st of the month. November 24th is day 1 of Trophy Run this month. If you're going to try for the trophy then, make sure to collect after the results of November 23rd but before 1:00 PM NST on the 24th, then collect again after the results on December 1st (2:15 PM NST) and before 10:50 PM NST! *Obviously, these are based on the scores needed at the time for each level on the 1st of the given month. **Aug 2013 was delayed due to not getting back from vacation until the 28th so didn't start holding on the 25th like I normally would have....and had I not held, again *kicks self*, it would have been March 14, 2004 for silver and January 31, 2005 for bronze. ***Had someone done the ultra-conservative in Day 2 of the Run, the result would have been 110:80 and January 13, 2000 for bronze. ****If you had bet the extra-risky day that paid off 168:10 instead of 28:10. *****If you had bet the extra-risky day that paid off 84:10 instead of 28:10. *For May 2014, the 161:80 was following the Conservative/Recommended bets, the 122:80 was on the Risky ones (that didn't pay off, obviously). For July 2014, I didn't get back from vacation until the 29th and the Run started on the 25th and I elected not to track a delayed run like I had in August the previous year. September 2014, we had the transition and the high score table didn't reset. October 2014, I didn't check due to waning interest and other assorted issues. November 2014, had someone collected in the brief window from when the gates opened at 2:15pm NST and the glitched trophy awarding time of ~4:15pm NST. How sad is it that a losing effort could have yielded a trophy? LoL.